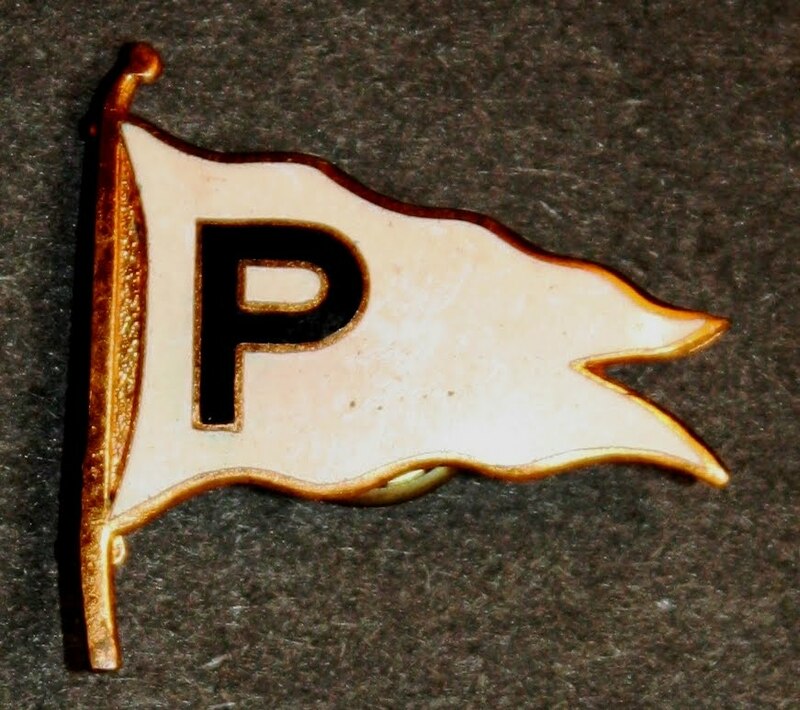 Panama Railroad Steamship Company hat badge. 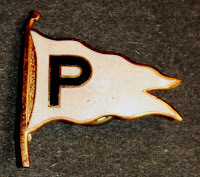 White enamel swallowtail house pennant (flag), black enamel P and gold fill. No hallmark, but definitely Gemsco. The rear screw and flag style dates to it to the 1940s-50s (see below). This could either have been mounted on a wool-backing in the center of a wire and thread wreath or applied to Maritime Service-syle eagle (although the shank is too short for the latter). Panama Railroad Steamship Company (also known as Panama Steamship Company and Panama Line) was incorporated in New York in 1862 (or 1889) and operated to 1981. There are differing accounts of how and when this line was established: it could have been in 1862 to funnel passengers and freight to the newly constructed Panama Railroad; or it was established in 1889 by the French Isthmian Canal Company to support its construction efforts. After Panama became independent of Colombia with U.S. support, the United States government took over the canal-building effort and purchased the assets of the already bankrupt French company, including the shipping line. The line's heyday was during the construction period; once the canal was finished in 1914 the line settled down to a more mundane level of business supporting the maintenance and operation of the canal and its supporting infrastructure, including the railroad. During the Second World War, the U.S. War Shipping Administration militarized the ships and crew, since cargoes traveling through the canal were of critical national importance; some graduates of the Maritime Service schools in Tampa, Florida and Pass Christian, Mississippi manned the company's ships. After the war, it was the target of constant attacks by privately owned shipping firms who disliked having to compete with a government-owned line, but the Panama Line was so efficiently run that it managed to stave off calls for privatization until Panama took over responsibility for maintaining the canal and railroad in 1981. A white swallowtail with a black P. 1912-1950s. P. Sources: Lloyds (1912), Wedge (1926), National Geographic (1934). A blue over red swallowtail with a white triangle in the hoist extending to the fork, and a blue P on the white triangle. late 1950s-1981 (conjecture). Source: US Navy H.O. (1961). A lot of people collect things. My hobby is collecting maritime artifacts with a focus on U.S. Merchant Marine and steamship company insignia - and of those, mostly hat badges (more properly known as 'cap devices') from the zenith of the U.S. shipping industry in the 1930s and 1940s. I also have a collecting emphasis on the U.S. Merchant Marine Academy at Kings Point. There's a lack of comprehensive information regarding federal and civilian maritime insignia and none on shipping company cap badges anywhere. The objects I collect are often interesting in their own right, however, once their stories are put in context, they take on greater significance. This blog is my humble contribution to the field. Expect an article or two every now and again. Be sure to click on the cap badge images, you'll be taken to a larger image for your examination. If you have any questions or comments, comment away. Further documentary evidence, which offers greater context to the posts, may be found here.